Prospero autumnalis Synon: Scilla autumnalis Autumn squill Σκύλα η φθινοπωρινή ￼ Hyacinthacea - hyacinth family Monocot. Hyacinthacea - hyacinth family Monocot. This delightful, little, autumn flower tends to grow in leaf strewn, dry, grassy or rocky places, where it blends into it's background; but once spotted can be recognised in a variety of locations. The short stalked flowers are arranged in compact panicle with the space between them increasing as the flowers mature. There are usually several flower stems arising from each bulb; the bulbs are surprisingly large, in contrast to the delicate flowers. 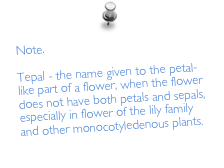 There are 6 tepals surrounding 6 deep purple stamens and central stigma. The tepals vary in shade from mauve to violet according to the light. The narrow pointed shiny leaves appear from the base after flowering.